Nicki Strong’s Blog: Finishing with a flourish! 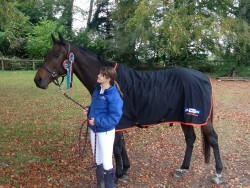 “Super Blue has been living up to his nick-name and finished the season with a flourish! After we both had a short holiday, I got Blue immediately back to work and had a showjumping trip to Altogether Equestrian to get some more course practice. We arrived to find the 3’ class had already just finished, so I opted to enter then next two – 3’3” and 3’6”. Eek! 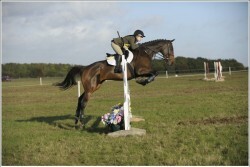 His biggest yet, so I would look on it as a schooling round. Imagine my surprise to find we were the only ones braving these two bigger classes! His jumping and attitude between the fences has improved so much, and he jumped a lovely round in the 3’3” just having a pole in the jump off when I rode a rubbish turn-back and left him no chance! I learnt from my mistake in the second round, and rode it much better. He had one down in each round of the 3’6”, which was very respectable on his first attempt, and I was thrilled with how he actually made it feel very comfortable. Two beautiful first place ribbons for his efforts, and some really good practice. 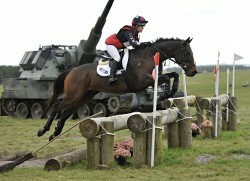 Next we headed to Larkhill BE100 for our last event of the season. On walking the course I was…apprehensive! Not quite as much brush and hedge as I’d like, and a few questions. They had a tricky sunken road question and another big step to jump off, both of these were a concern as Blue has in the past been a bit of a wimp about heights bless him! A number of accuracy questions too. On the day our dressage was not our finest effort, as some very scary flowerpots at ‘A’ caused much wiggling and loss of concentration! The showjumping again was much improved; Larkhill is on a sloping surface making the showjumping tricky, so balance would be tested. He rode really well, and I was disappointed to have a couple of poles; there was quite a distance to the last line of fences so he just clocked them from a way off, put his head up and got too fast and flat. A shame as he really felt much better than the paper result show. Feeling a little flat I headed over to the XC, and he just flew round. No concerns about anything, he felt like a class act and I was grinning from ear to ear when we crossed the finish line. Ending the season with 2 confident BE100 runs and clear XC rounds is great for our first season, and more than I could’ve hoped for. A week later we headed back to Larkhill to have another bash at the XC, for the Army and RA hunter trial for a bit of fun. The fences had changed from the previous week and I didn’t get the chance to walk it – essentially I had to gallop and look for the pink flags – don’t try this at home kids! Certainly not something I would recommend. Regardless my little XC machine did another super clear, and managed to come home 18 seconds inside the optimum time. We came 10th out of around 50 competitors in the class, just a little too fast to finish higher up the order.